Today I would like to show you another waterfall that is found in our new home county of Transylvania. I love that we hardly have to travel to go find waterfalls and since waterfalls are one of my favorite things in nature you can imagine how happy I am to live in a county that boasts 250 waterfalls. This one is a very easy one to access–hardly any hiking involved at all and the day we visited it was not all that crowded so we were able to spend some time getting some nice views. 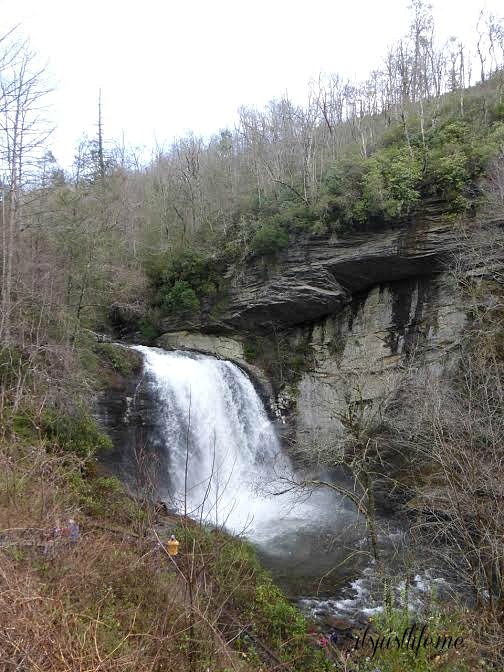 Looking Glass Falls is probably one of the most popular falls in the area mainly because of the easy access to view it. It gets its name from Looking Glass Rock which is a very popular rock climbing area. The falls are beautiful at any time of the year but when we visited it was especially beautiful due to recent rains. Of course you have to be very careful when you visit places like this. There have been reported deaths and many injuries of folks who just do not heed the warnings of staying in designated areas at the falls and that is something that is just irresponsible and tragic. There is no need for a wonderful visit to turn into a tragedy just because you wanted to get that really amazing selfie. Looking away from the falls is just as beautiful as looking at the falls themselves, don’t you think? 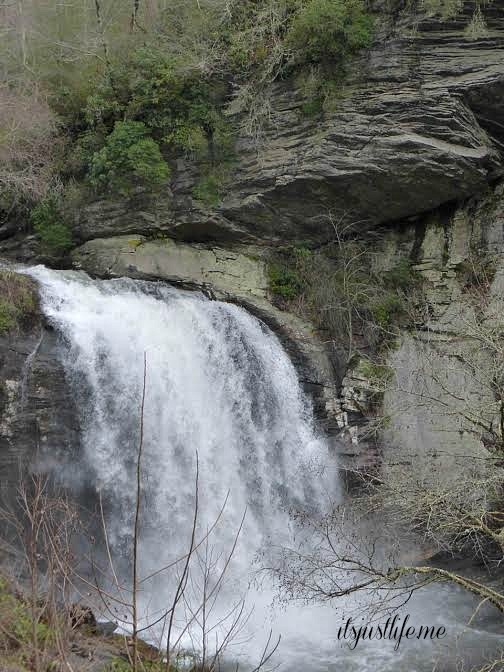 The falls are very easy to find as they are right off the side of the road on U.S. Highway 276, approximately 5.6 miles north of the intersection of 276, U.S. Highway 64, and NC Highway 280 in Brevard, North Carolina. I also wanted to give a shout out to the North Carolina Blogger Network . I am happy to be a very small part of this group since my move to North Carolina. While I have not been able to attend any events I have connected with several bloggers and am happy to be a part of this wonderful network. Right now they have a giveaway going on and one lucky winner will receive a $200 Visa Gift card compliments of Benjamin Franklin Plumbing of Charlotte. Clicking on this link will take you to the giveaway page where you can follow some simple steps to be entered. Good luck! Thanks to Benjamin Franklin Plumbing for the great giveaway! How beautiful! And great that they’re accessible without much (ANY?!) hiking. I’ll keep this in mind if Motor Man and I ever plan a trip to that area. 250 waterfalls in your county?? Amazing! We are so lucky to live in an area where there are so many beautiful places to explore, aren’t we? And we have only just begun! Yes! Waiting for you to come back so maybe we can take a couple hikes together! Red eye tonight! Yawn. Maybe next week???? So pretty! I love waterfalls too and enjoyed visiting as many as we could when we lived in Oregon (famous one — Multnomah Falls). I’ve heard before that there are tons of falls in NC. Thanks for taking us along to this one! I have not seen waterfalls in Oregon so I need to put that on my bucket list. I have heard of Multnomah Falls so I need to definitely make that trip, don’t I? I see what you mean — looking into a waterfall can be invigorating, but the scene looking away from the waterfall is absolutely serene. So beautiful! Yes! It is serene and calm at the other side and such a beautiful view. Thanks for stopping by and commenting! What stunning scenery. I, too, love waterfalls. There is nothing like a waterfall –another thing that shows God’s presence in every drop. I never thought I would live someplace like this—Chris has always loved the mountains and I have always loved the beach but the mountains have won me over. Thanks for stopping by, Marian! Thank you, Katy! I think so! Beautiful! 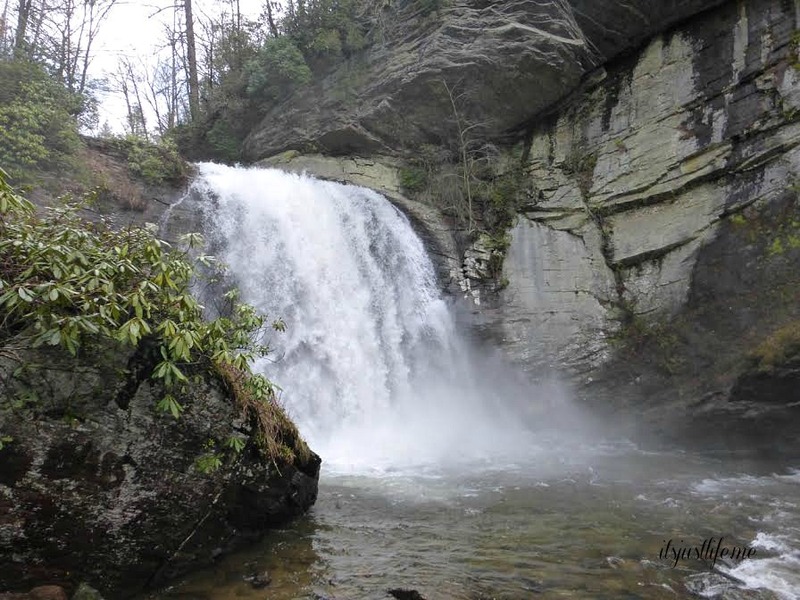 Last oct we went to the smokey mountains and did a little waterfall seeing in NC… What a beautiful state! It really is amazing all that we have within a very short drive. Thanks for stopping by! Thanks! I love all that we have to go see almost in our back yard. What a lovely spot – how nice that it is so close to you! And yes people be safe!!! I could not believe the number of people who got close to the ocean – on slippery rocks!!! – to see the giant waves crashing upon those same slippery rocks, when I was at Peggy’s Cove in Nova Scotia. A girl actually was swept in and the Canadian Coast Guard had to send a boat and diver in to save her. You have to swim out into the ocean or else the waves will just keep knocking you back against those sharp rocks — so there she is bobbing up and down in the waves, still holding her camera like an idiot while we keep her frantic boyfriend safe on the shore because he wanted to jump in and save her! Sometimes I wonder about this natural selection thing….. ha. That is exactly what Chris says about natural selection!!!! We have been to Peggy’s Cove and I can picture that happening !!!! Oh my. Very beautiful! Can’t wait to visit you someday. I’m also astounded at the number of waterfalls! Beautiful photos! And yes, they have their number of tragedies, sadly–even before the advent of selfies. I just think people don’t always use a lot of sense when it comes to obeying the “rules” at places sometimes. One small slip up and you can really get hurt.Thanks for stopping by! 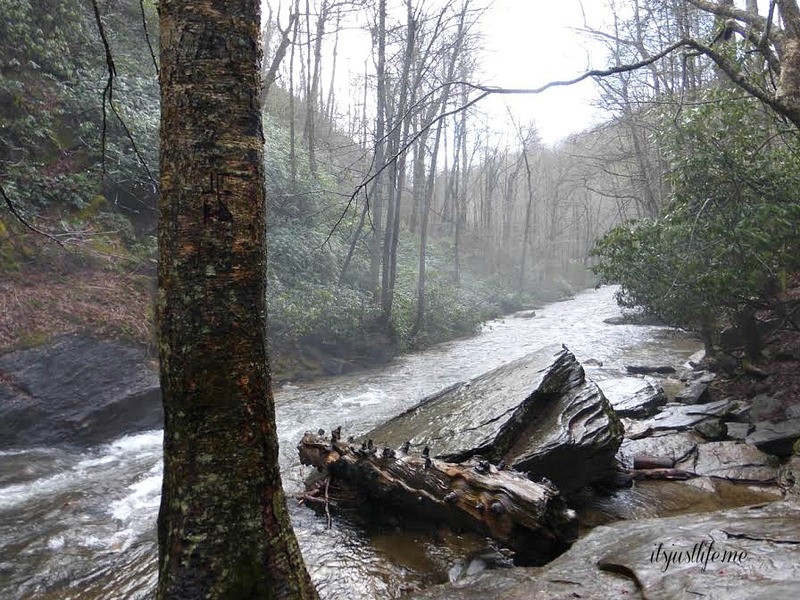 Thanks so much for sharing these beautiful pictures and for the NC Blogger Networking shout it. It’s so appreciated and I hope it will let others know we’re here and happy to build a strong community. I am so happy to share such a great group with everyone—that is an easy thing to do! I do not think we have any monsters around here but we do have hotels! I will keep my eyes open and get back with you if I hear of any! 🙂 Thanks for stopping by!